M&A activity got off to a sluggish start in 2018 compared to the previous year, but 2Q showed a marked improvement over 1Q. The uptick means that though this year is unlikely to outpace the records set in 2015, it's ultimately on pace for a strong showing across North America and Europe. The rise in M&A investment in 2Q versus 1Q was due largely to several completed mega-deals. Four transactions with values greater than $10 billion closed last quarter, among them Vodafone's $21.8 billion purchase of UPC Czech and Bayer's $63 billion acquisition of Monsanto. Transaction sizes in North America and Europe have climbed steadily since 2009, when the median values in the two regions dropped to $15.2 million and $14.0 million, respectively. Despite 2018's relatively sluggish start, the median deal size is thus far at a decade high in both areas. The spike has been most dramatic for platform buyouts, where the median deal size has risen at a compound annual growth rate of 18.4%, surpassing both add-on buyouts (15.3%) and corporate acquisitions (11.6%). Although all the deals above $10 billion in 2Q involved corporate acquirers, publicly traded small businesses account for an outsized portion of acquirers compared to PE-backed companies, driving down the median deal size for corporate acquisitions. Since reaching its peak in 2015, M&A deal count has been declining as corporations remain confident in the global post-crisis economy. However, the estimated number of deals closed shows a slight improvement over the past few quarters, and average deal sizes are larger overall. The core middle market, covering transactions of $100 million to $500 million, has increased its share of overall deal count over last year, as have deals over $5 billion. Deals of less than $100 million still represent the largest share numerically, but they currently make up a slightly lower proportion of overall value relative to years past. The energy sector is up slightly in its proportion of deal value in Europe, but in North America, the space has thus far been eclipsed by a spike in the materials & resources, financial services and B2C sectors in particular. Total deal value in 1H 2017 was $215.7 billion—nearly 54% higher than the $140.3 billion closed in 1H 2018. Last year's strong start included eight mega-deals, but lately, the sector hasn't seen those outsized transactions. None have closed in the previous three quarters, compared with 11 in the three before that. Before 4Q 2017, the last quarter that passed without a mega-deal closing in the financial services sector was 3Q 2013. 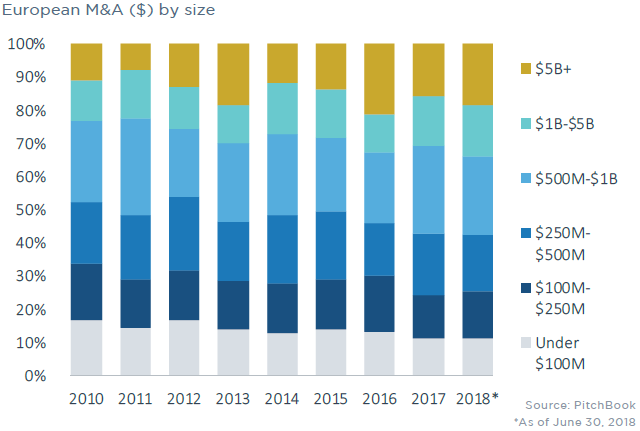 Given the lack of mega-deals, the drop in deal size makes sense, with the average financial services transaction in 2018 down more than 31% relative to 2017. Average deal size across all industries so far is up 20% over last year. Both deal count and deal value have dropped precipitously in Europe in 1H 2018 compared with 1H 2017, marking the region's largest decline in M&A share since 2014. However, activity continues to be robust, and this year is expected to improve in its final six months. One reason for the decline is related to currency: Our M&A figures are priced in USD, and as the dollar has recently strengthened, the USD-denominated M&A value in Europe has fallen accordingly. Deals over $500 million account for more than half of M&A activity in Europe thus far this year. 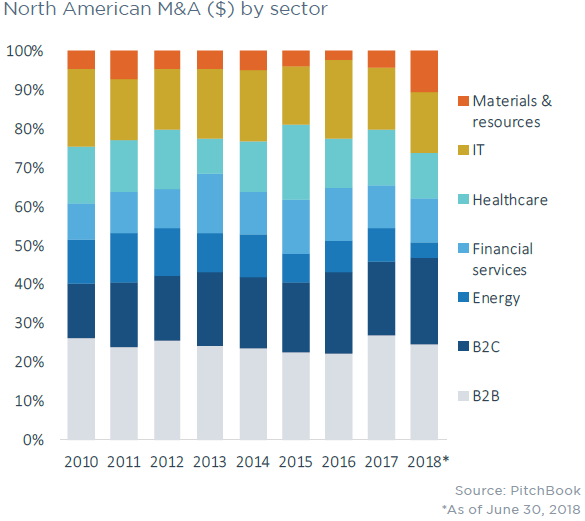 Deals above $5 billion are at roughly their third-highest proportion of overall activity in the past decade, but the pipeline of announced mega-deals has grown this quarter, as large companies in multiple industries have become particularly acquisitive. Looking for more details? Check out the full 2Q 2018 M&A Report.